Thinking of how the relative sizes of countries and how the geography of world production and trade will be affected in the long run must be based on sound economic reasoning about the determinants of long term growth. 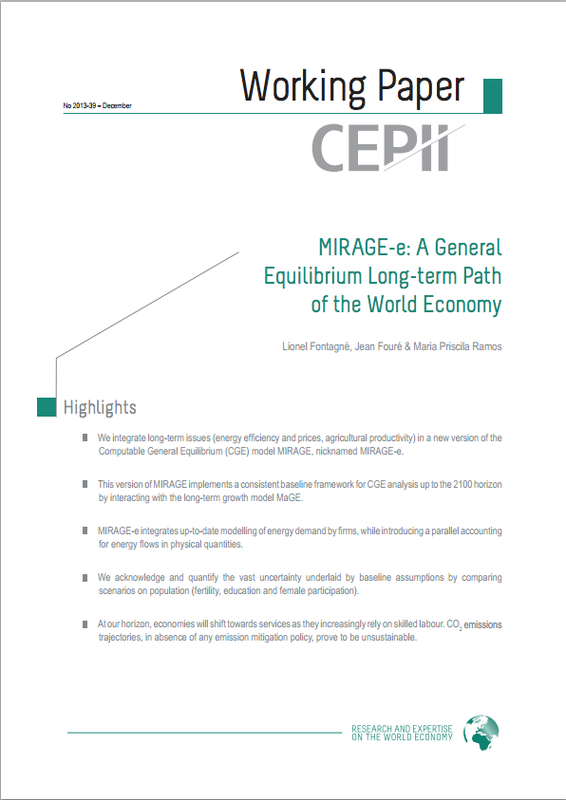 It must also be embedded in a general equilibrium framework that takes account of the interactions among markets and sectors, as well as between countries. This paper takes stock of a three phase research project. The first step consists of deriving and estimating a three-factor (labour, capital, energy) macroeconomic growth model for a large set of individual countries, which fits two forms of technological progress (standard TFP and energy efficiency). The second step consists of recovering the sectoral detail with an energy-oriented Computable General Equilibrium model of the world economy calibrated to fit these projections. In a third step we confront the assumptions for our baseline to alternative scenarios.